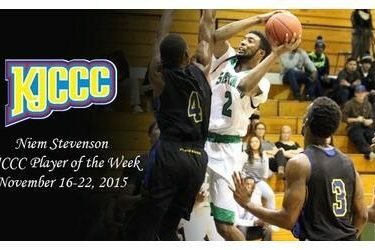 For the second time on the early 2015-2016 season, Seward County sophomore Niem Stevenson has been named the Jayhawk Conference Player of the Week as announced by the league Monday. Going up against three top notch opponents this week, Stevenson put on a show, averaging 28.7 points and 7.0 rebounds per game for the Saints. Wednesday on the road against #4 South Plains, Stevenson scored a game high 30 points in an 81-79 upset win for Seward over the Texans. Highlighting his big night even more was Stevenson’s buzzer beating scoop shot to break the 79 all tie and give the Saints the win. Friday night against a 7-1 Frank Phillips squad, Stevenson went for a game high 29, also pulling down a team best 9 rebounds as Seward cruised to a 90-75 win. In the Saints final game of the week, Stevenson again scored a game high, this time 27 against a very talented Midland team in a hard fought 93-89 loss for Seward. On the season, Stevenson leads the Jayhawk Conference and ranks 6th nationally in scoring at 23.7 points per game. Stevenson and the Saints will be back at it on Friday as they take on Missouri State-West Plains in Garden City at 3:00. Seward will then wrap up their non-conference schedule when they take on Western Iowa Tech in another matinee Saturday in the Perryman Center.